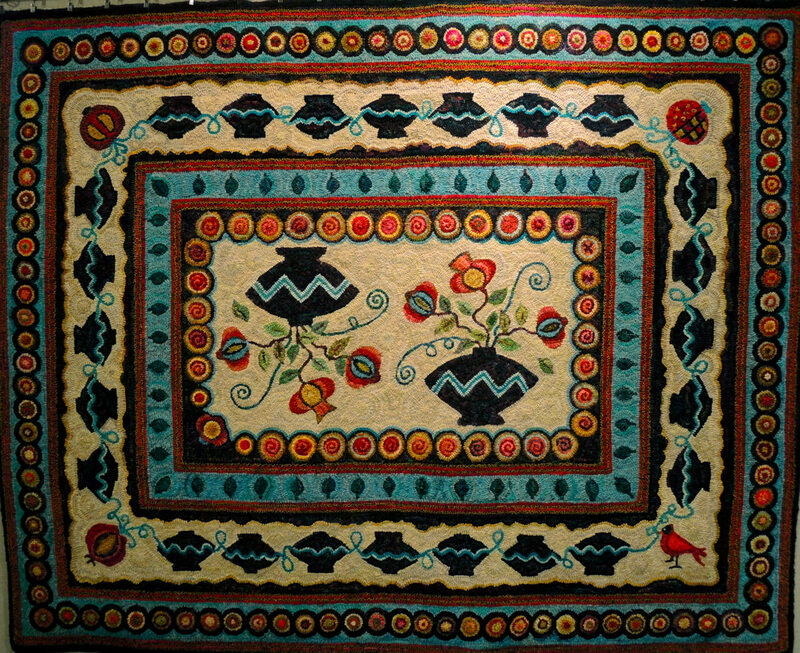 A new show of hooked rugs by the Moira Mat Makers opened at the Gallery in the Belleville Library. 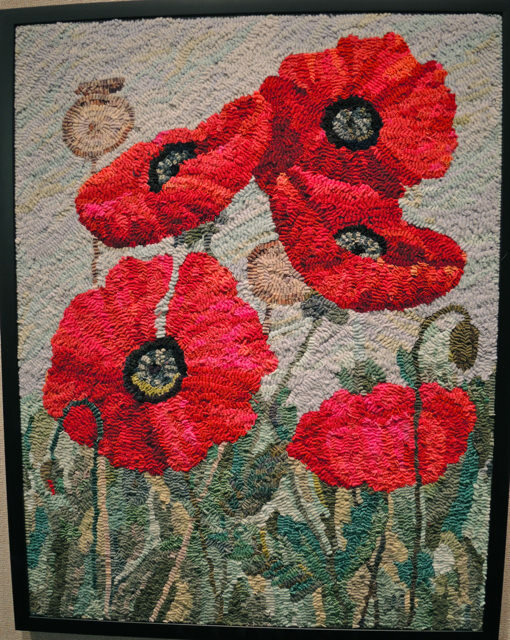 If you are in the area, I encourage you to see this excellent display of rug hooking. 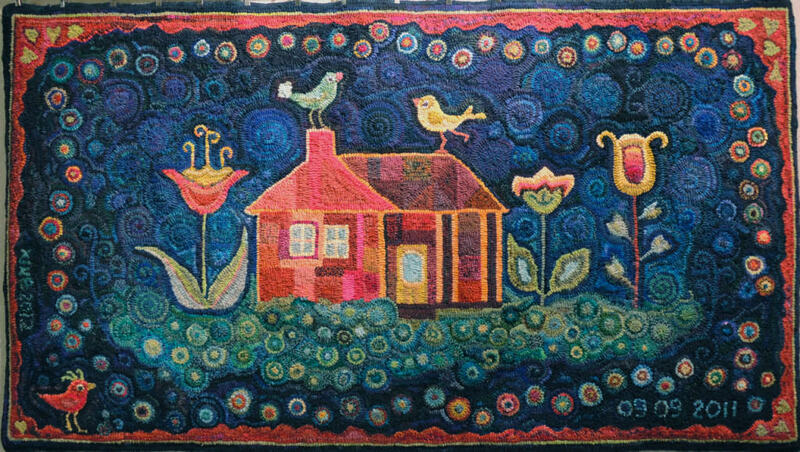 The first two are my own rugs and then a few examples of the many wonderful pieces on show. 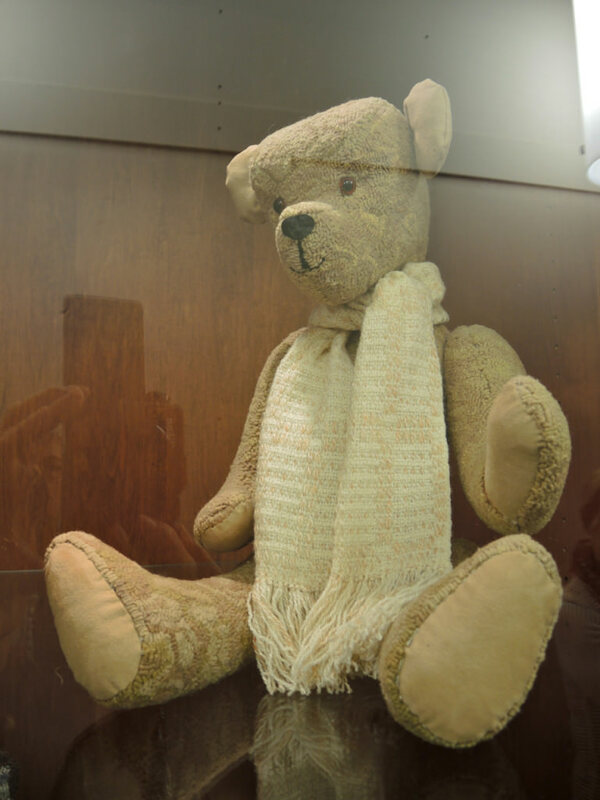 The final piece in the showcase (so not a great photo) is of the darling bear hooked and sewn by Glenn Ryley Cotton. Note also his hand woven scarf! The show runs until September 17th. The KD Delta bag is finished and soon will be on its way. 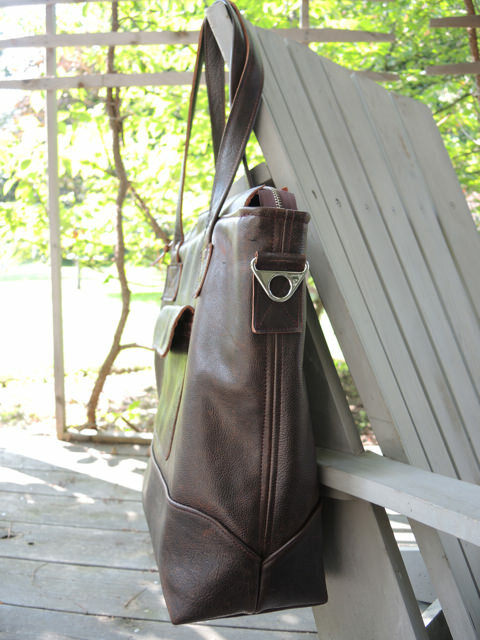 This bag is 17″ wide, 13″ tall and has a depth of 5.5″. 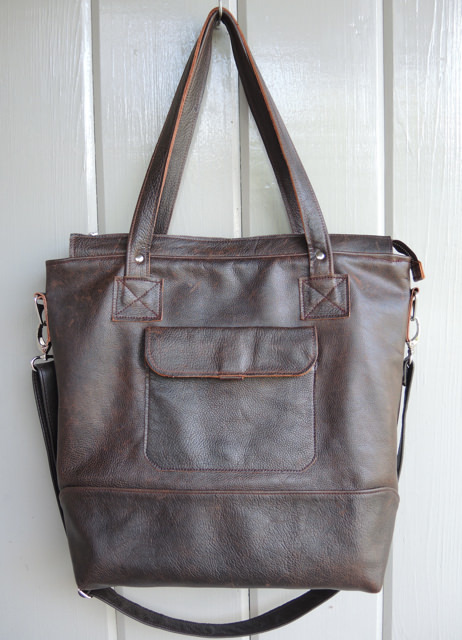 It has two ways to carry it: a removable and adjustable cross-body strap as well as padded carry handles reinforced with rivets. 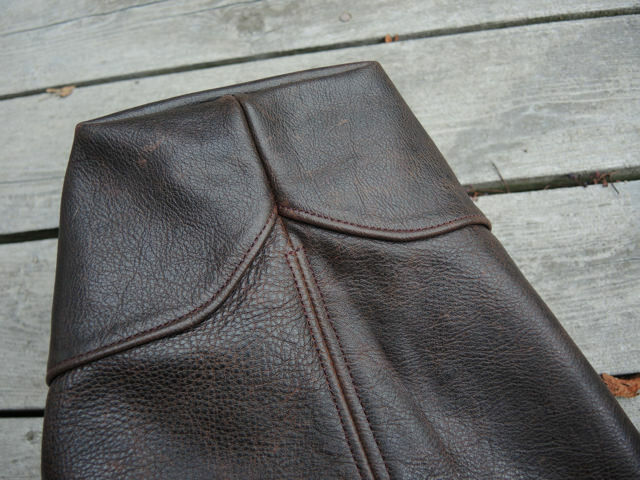 The outside has a pocket with magnetic closure and inside there is a leather phone pocket and canvas zip/slip pocket. 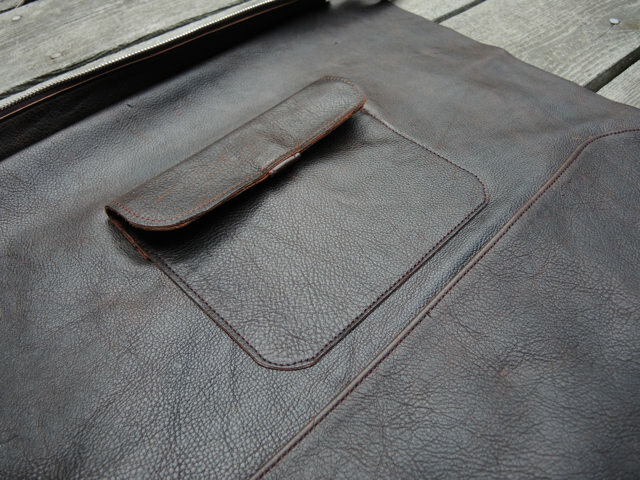 The bottom is well reinforced: double leather on the outside and durable waxed canvas inside. 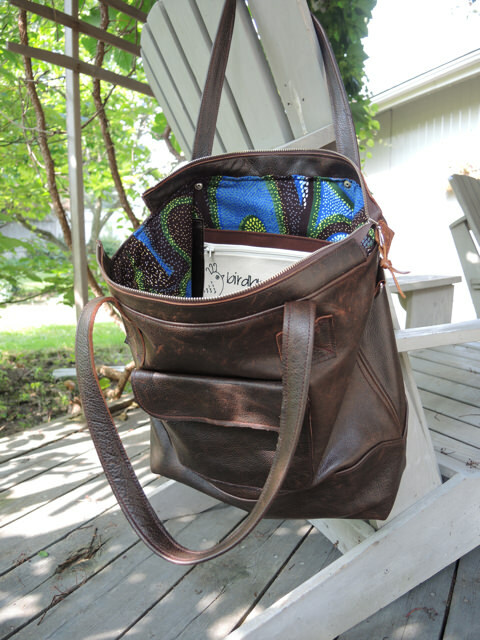 It is big enough for a lap top, or would make a great weekend bag. 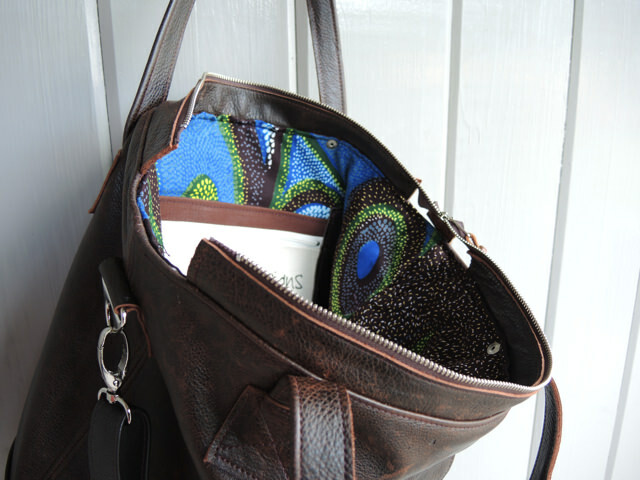 The bag closes securely with a durable metal zipper and inside is bright blue and brown patterned cotton from the Bodo market in Kenya. 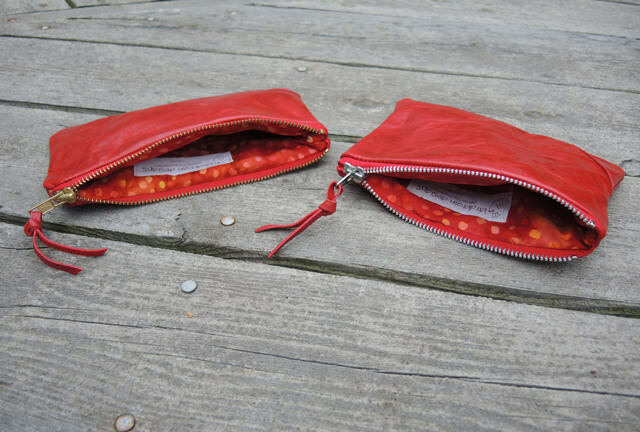 I found a small remnant of the best red leather this week. 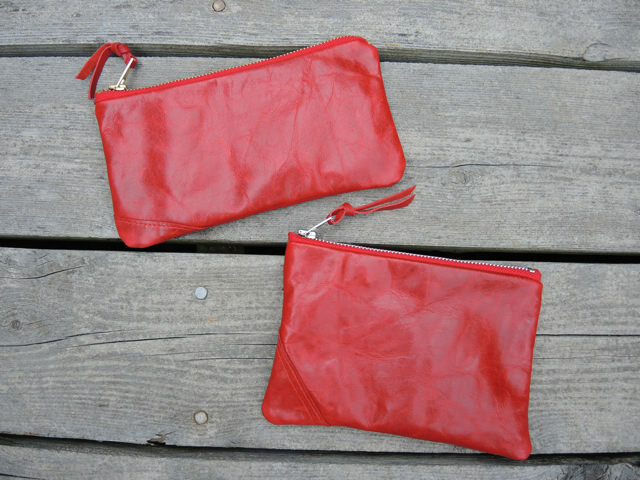 It was just enough to make two new pouches, perfect for make-up, pencils are any other essentials you need to carry with you. 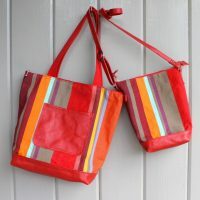 This is really beautiful leather in a red lipstick colour lined with red and orange dotted batik. A treat for the hand and the eye. In the on-line store for you. This is a quotation from Simone Ridyard’s marvellous new book, Archisketcher. Urban sketching is a rapidly filling field; there are almost too many books to choose from. But this one is a great one. The text is well-organized and carefully explained and the concepts are illustrated with excellent examples from a variety of the best urban sketchers. But back to the quotation. 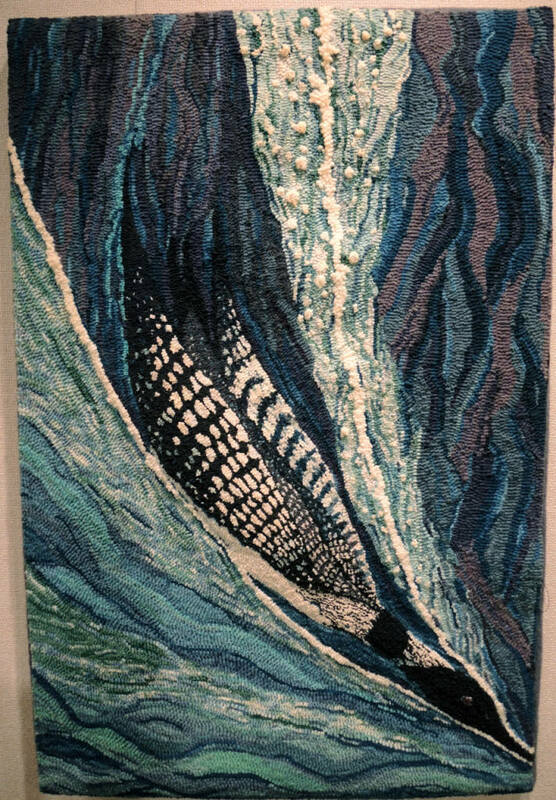 I take heart from the thinking about mistakes, and being a fibre artist, I love the idea of a sketch being a tapestry of lines. We were in Kingston yesterday and I had an hour to sketch. I sat in the open window of a café with a good view of the tower of the City Hall. This is one of my favourite buildings and I have sketched it before. Yesterday afternoon there was a big storm coming. I just finished the sketch as the drops began to fall. I’ve been experimenting with skies and yesterday’s sky was full of grays and purples. A run back and a blob are a few of the mistakes in this quick sketch but just looking at it now I am reminded of the stolen hour before the storm and the great fun it was to sketch such a magnificent building. 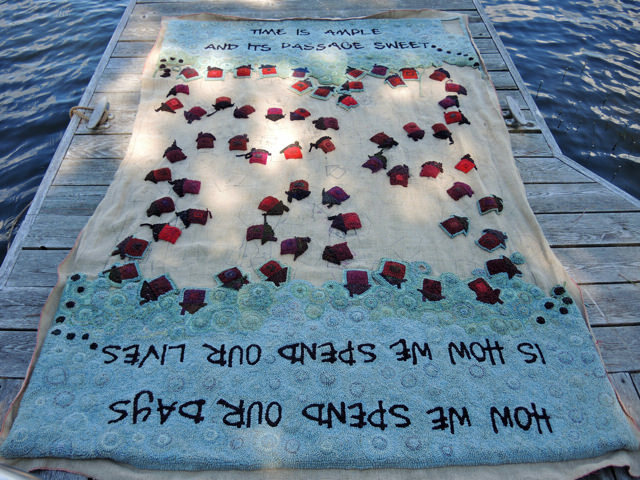 I have had a chance to spend time hooking my big rug this summer. 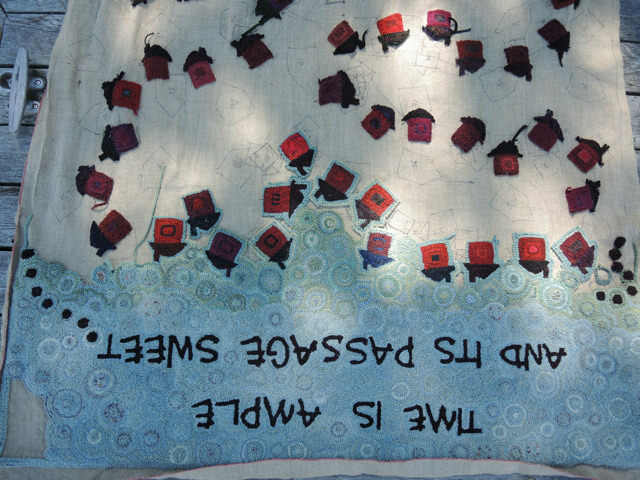 I affectionately refer to it as Annie because of its Annie Dillard quotation which fills each end border. 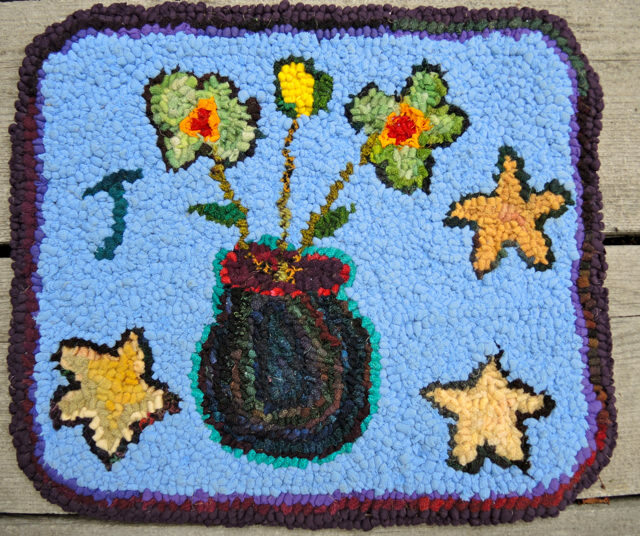 If you check here or here you will see I have been hooking this rug for a good long time. 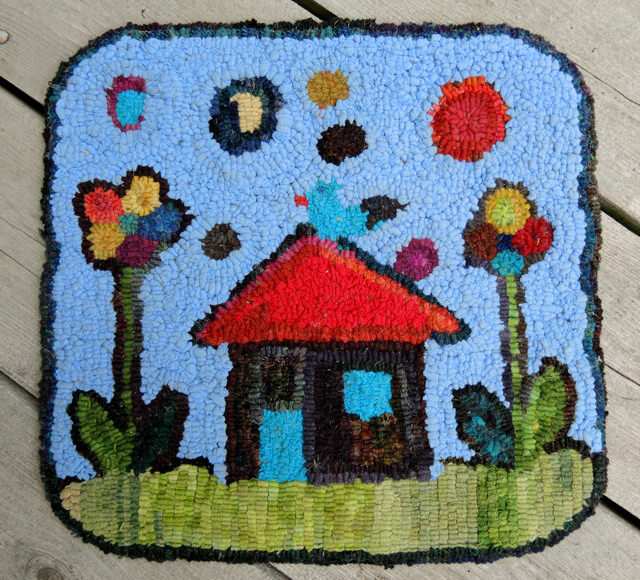 This summer I finished the 65 houses and have made some headway on the green section of the rug. The design decisions are pretty well finished now and it is just getting down to hooking it. The green sections will morph back into blue in the centre. I say the design is finished but I’m now toying with the idea of hooking arrows into the ground among the circles, just to point the way as it were. And I’ll say publicly here that I plan to have it finished for next year’s annual. There, I’ve set the challenge. 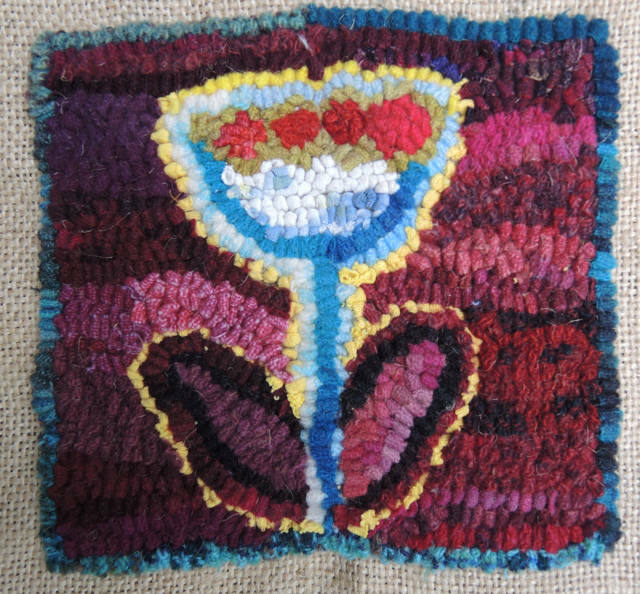 We are back home after a few weeks at the cottage and I hope to also start on the bags which have been ordered. 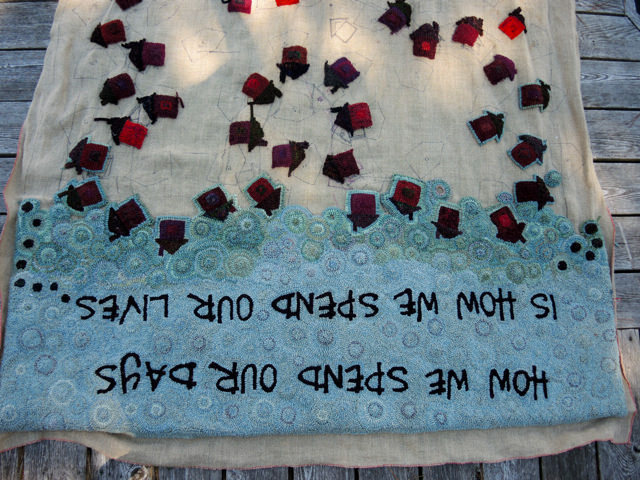 I’ve been away from the sewing machine all summer. 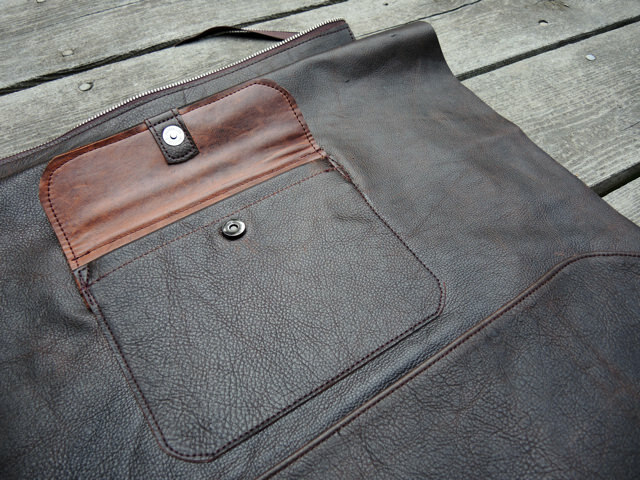 In the works is a new Delta bag and a man’s messenger bag as well as a couple of others. I’ll post as soon as I have something to show. I am excited to tell you about the upcoming rug show in Belleville Ontario at Gallery 121. 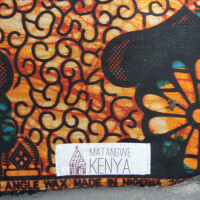 There will be a collection of the beautiful hand hooked mats and chair seats done by the women of Matangwe Kenya. 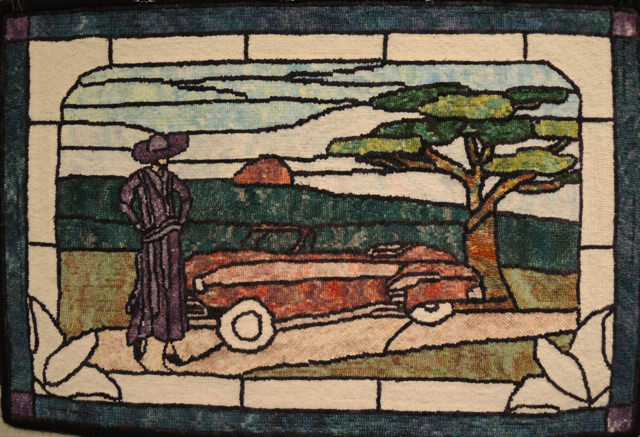 Each piece reflects the world of rural Western Kenya and highlights the women’s unique sense of colour and design. 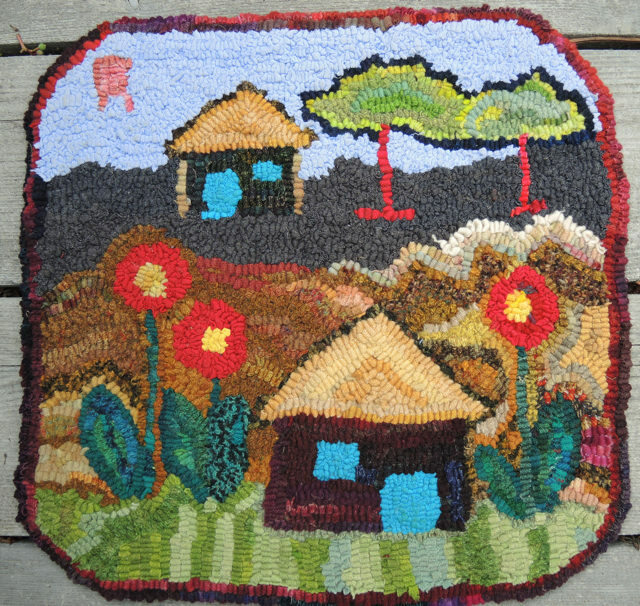 Above is a chair seat depicting the mud huts, acacia tress and rolling hills. Below several more examples of the charmingly simple designs and stunning use of colour. 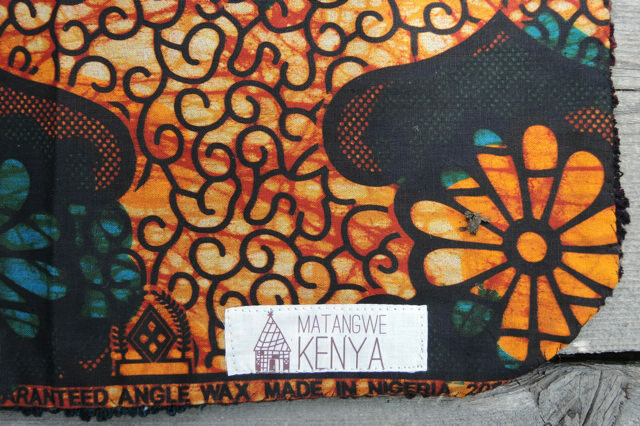 The left thumbnail is the back of a chair seat–wax printed cotton from the Bondo market and the Matangwe label based a drawing by one of the school children. 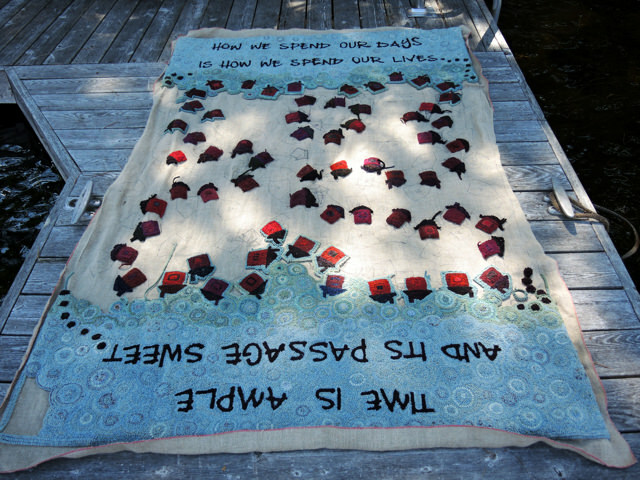 All the pieces are hooked with found recycled cottons from the Bondo market and wool strips and old t-shirts donated by Ontario hookers. And it is all done without hooking frames or cutters. Marvellous! 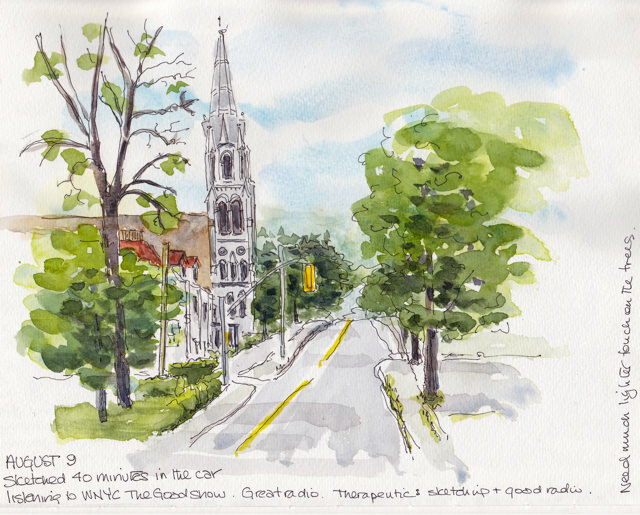 On Sunday, I sat in my car on a deserted street and did a quick sketch facing north. It was an hour out of this week’s too busy schedule. I am trying for a looser scribbly line and quick impression. As I sketched I listened to Radio Lab –it’s sad that the best programming on CBC is no longer Canadian–and did this quick sketch. I find that an amazing way to recalibrate. It’s like a good bike ride or a good massage–a kind of mental realignment.